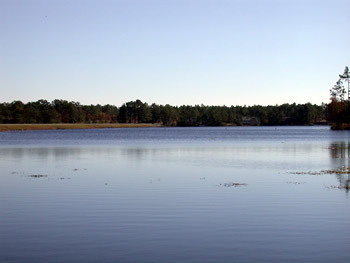 Boiling Spring Lakes is a quiet town eight miles northwest of Southport. The town derives its name from a boiling spring (see photo) that flows with an incredibly pure stream of water. The town’s centerpiece, the 150-acre “Big Lake”, is just one of more than 50 natural and man-made lakes in the area. The “Big Lake” is fed by five springs and Allen’s Creek, and is 2-1/2 miles long with 10 miles of shoreline. Many years ago, the spring was known as Bouncing Log Spring, inasmuch as a large chunk of petrified wood was tossed and churned in the water gushing up from the ground. Eventually, there was no longer a log being bounced around by the upward thrust of groundwater, and the name was changed to the Boiling Spring. State geologists have calculated that the spring discharges approximately 43 million gallons of water each day. The entire area seems enchanted with tall pines, oaks, and sweet gums hovering over the spring. In the early spring, damsel flies of red, green, and blue dart about the area and butterflies of all colors and descriptions flutter in the thickets. Two protected areas, Boiling Spring Lakes Nature Trail and Boiling Spring Lakes Preserve are located within the boundaries of the the Green Swamp (View Map). The Green Swamp is the largest wetlands area in North Carolina and one largest in the nation. Boiling Spring Lakes is 10 minutes from Southport, 15 minutes from Oak Island, 25 minutes from Holden Beach and 30 minutes from Ocean Isle Beach. The Wilmington International Airport is 30 minutes north and the Myrtle Beach International Airport is 45 minutes south. Boiling Spring Lakes is 25 minutes from historic Wilmington, N.C., and Myrtle Beach SC is 40 minutes away. The town is located in Brunswick County via US Highway 17 to NC Highway 87.